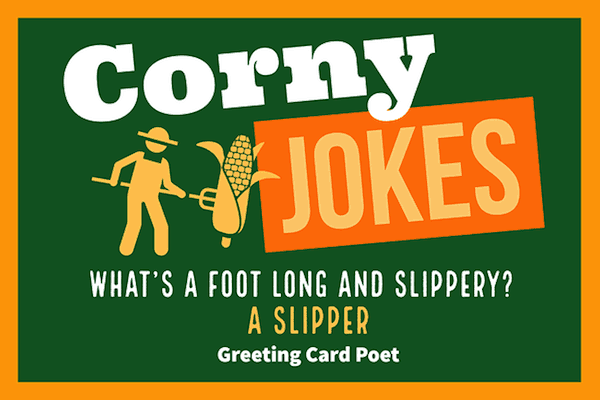 Our corny jokes will make you groan at their awful corniness. So, you probably have heard a ton of jokes in your life, but we bet when you hear these you won’t be able to wait to tell it to share with your family and friends. Even if it’s just to see them roll their eyes at how bad your joke is, it’s still funny just to watch their reaction. Just for your enjoyment, here are some of our favorites listed in many different categories we promise will have everyone in the room hysterically laughing at! Don´t believe us? Go ahead and read them for yourself! Laughter is the best medicine and a very good stress buster and these jokes will destroy the common misconception that corny jokes are just for kids. Please delight in our collection of only funny groaners. Why are fishmermen only on a seafood diet? Because every time they see food, they eat it. Why does the man tuck his knees into his chest and lean forward to go places? Because that’s just how he rolls. What did the coach say to his losing team of snakes? How do you change tires on a duck? What do you call cows who give no milk? What do you call a dinosaur with a extensive vocabulary? Did you hear about the man who was on trial for feeding his cows dynamite? The jury said it was a-bomb-in-a-bull. Want a piece of me. 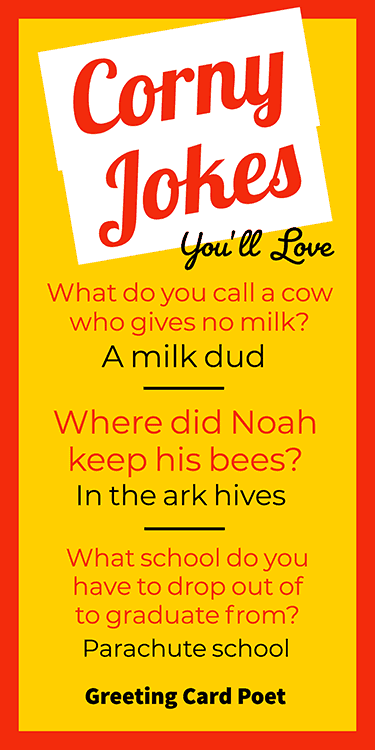 You might like our humorous jokes page. I really love you with all my art. What kind of girlfriend does a potato wants? What’s green, brown and white and can’t climb a tree? A fridge in a combat jacket. What do you call a bomb that doesn’t explode but lands on a cow? Why was the bank teller mad that he left his library card? Because he wasn’t able to check anything out. Why was the farmer scared to go in his corn field? Because he feels like he’s being stalked. Why was the tea cup so into the Earl Grey? Because he was such a hot-tea. What school do you have to drop out of to graduate from? You go ahead, I’ll hang around. What do you call a pretty ghost? What do you call a row of rabbits hopping away? What is the difference between a poorly dressed man on a tricycle and a well dressed man on a bicycle? What’s white and can’t climb a tree? Have you ever tried to iron one. Where does the electric cord go to shop? Why do cows wear cowbells? What goes under your feet and over your head? What would you call a humorous knee? What did the alien say when he was out of room? More than you can af-Ford. Why is corn such a good listener? Why shouldn’t you play cards on the savannah? Because of all the cheetahs. Why could the bee not hear what people were saying? He had wax in his ears. Why did the pig get hired at the restaurant? How did the pirate stop smoking? What kind of crackers do firemen like in their soup? Looking a little pail there. I better not tell, it might spread. What is the quietest kind of a dog? What did the belly button say just before it left? What kind of potato chips fly?